BBC Two - Trust Me, I'm a Doctor, Series 3, Episode 1 - What’s the best way to clean out my ears? Ear, Nose and Throat surgeon Gabriel Weston examines the best, and worst ways, to clean your ears. Most of the time our ear canals clean themselves; as we talk, chew and move our jaws the earwax and skin cells slowly move from the eardrum to the ear opening where it usually dries, and falls out. Earwax doesn't usually cause problems, but if too much earwax is produced it can cause a blockage which can be painful or could cause hearing loss. 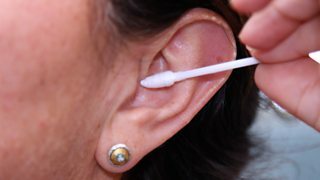 When we use cotton buds, what we actually end up doing is pushing earwax deeper into the ear where it gets stuck in the parts that don’t, and can’t, clean themselves. The trapped earwax may also contain bacteria from the outer ear that could cause infection. Furthermore, removing wax with a cotton bud can irritate the skin of the ear, and this often encourages people to poke around even more; it’s a vicious cycle . However, in some cases if the bud is inserted too far into the ear, there is a risk of perforating the eardrum, causing sudden pain, bleeding and temporary hearing loss. If you would like to try olive oil or almond oil to soften your wax - warm the oil up to body temperature and lie down on one side. Use a dropper to apply a few drops of olive oil into your ear and stay in that position for 5-10 minutes.